Sophia Garcia is an undergraduate intern working in Human Resources. She is a sophomore double majoring in government and philosophy. She plans to stay in Austin this summer and enjoys exploring gardens, playing guitar, and reading. Sophia usually plays classical guitar, though she dabbles in other styles, and her favorite novel to date is My Name is Asher Lev by Chaim Potok. 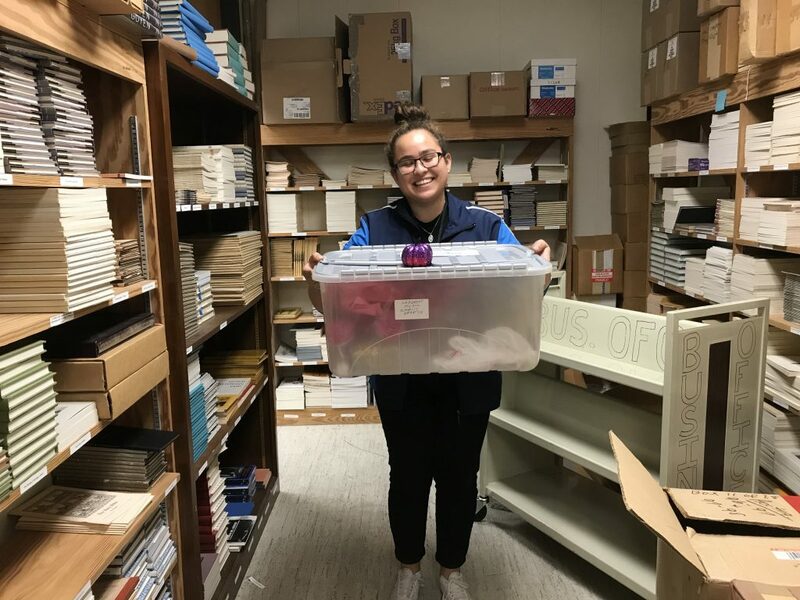 What drew me to this internship: I initially began to look into an internship at the Harry Ransom Center through my scholarship program — University Leadership Network. I went to our required internship fair on Valentine’s Day my freshmen year and that is where I met Julia Tufano and Elizabeth Matlock — my soon to be supervisors. I suppose what drew me to this internship was the promise of growth on a professional scale, that and I’ve simply always wanted to work/intern at a museum. The art and creative energy surrounding the HRC drew me in as well. I typically work longer shifts opposed to several short shifts. So, I’ll come in three times a week. When I get here the day usually starts out as a de-brief of the day’s tasks with Julia Tufano, my supervisor in HR, and then the rest is mildly hands off unless I need instruction. I usually start with updating PDF applications for new hires or departures, then I respond to emails, make edits in the staff portal, document the staff hires and departures within the Ransom Center, update UT Box, UT’s cloud storage system, with newly scanned and documented information, and help do research for future events. What are some projects you’ve completed, and of those, which is the most important to you? I’ve worked on a few projects since I’ve been here at the Ransom Center. One that I’ve worked on was creating a spreadsheet of competencies to help ease the interview process and enable interviewers to truly pinpoint what they are looking for in an intern or employee. I’ve also worked on an inclusivity project where I went through the entire staff portal and checked every document for instances where only the binary terms “he” and “she” were used as opposed to “they.” Afterwards, I consolidated all of the documents that neglected to include the gender neutral term so that HR could reach out and ask staff members to update their documents to create a greater state of acceptance within the Ransom Center community. It was an odd project as I’ve never been in a position or an organization where people did care about being allies to the LGBTQA community, and it was satisfying to know that I was a part of that change. What are some of the skills you’ve developed in this role? I know that it is often said that people are harder on themselves than they are on others about social skills and that everyone is nervous, but I used to truly believe that I was horrible at social settings. Since starting at the Ransom Center, I’ve come to learn that people want to be heard more than they actually want to talk. The key to having a great conversation is being genuinely interested in the people that you’re listening to and to be mindful of what they are saying. Timing has never been my forte. I grew up in a house with the “we’re there when we’re there” mentality. As a result, I often am five minutes late to most functions. While working at the Ransom Center, timing became extremely important as we are working with experts in their profession. I’ve gotten a lot better at getting to things on time and getting projects done on time as well. My internship in HR is essentially making a lot of compilation lists of data and entering them in Excel. I came into this position not knowing a lot of how to operate that beast that we call Excel, but after a healthy seven months interning at the Ransom Center, I can say that I feel comfortable working on a project completely in Excel with little to no instruction. I’ve also had to leaf through so many resumes that I think it has rubbed off on me on what constitutes a well written, tailored resume. I have learned about the resume process primarily through exposure and it has easily transferred into my own resume building skills. What surprised you about your internship? How well I get along with my supervisor, Julia Tufano. I’ve never had a mentor-mentee type of position before, so I was nervous that it would be awkward or that our two personalities wouldn’t mesh, but it’s been a wonderful experience. I feel like I’ve learned a lot from her about leadership as well as keeping calm and collected in a workplace. What is your favorite item at the Ransom Center? The Gabriel Garcia-Marquez portrait on the 3rd floor. How has this internship influenced your academic interests or future career? It has shown me how an office truly works, and that to helm an organization such as the Ransom Center requires a level of transparency that I had not even thought about before. I want to go into law, and it’s not often elucidated to us in our classes that you have to be mindful of everyone and consider every facet of a problem—I think working in HR has shown me how to be more sensitive to whatever situation is at hand. 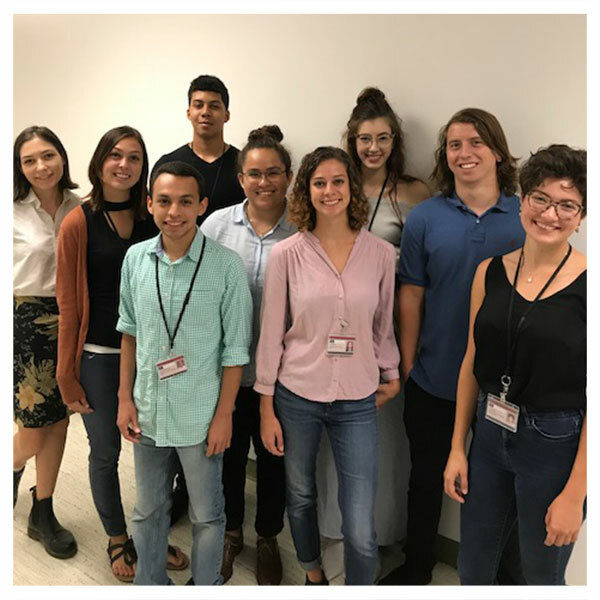 Top photo: Sophia Garcia, fifth from left, with her undergraduate intern cohort.